Larrivee Guitar Forum > Forum > Main Forums > Non-Guitar Discussion > Got Dogs......? Here is Kaleb our Black lab. As you can see he is un-phased by the cold and snow. He is official greater, receiving manager ( ups and FedEx must pay one dog brisket to leave a guitar ) and great companion. Me. "When you chose a Lab, you did understand they are a working breed?" Owner, who just doesn't get why his eight month old Lab is destroying the house. "Huh?" I think I'd be apt to throw Kaleb a dog biscuit or two. Great name, btw. 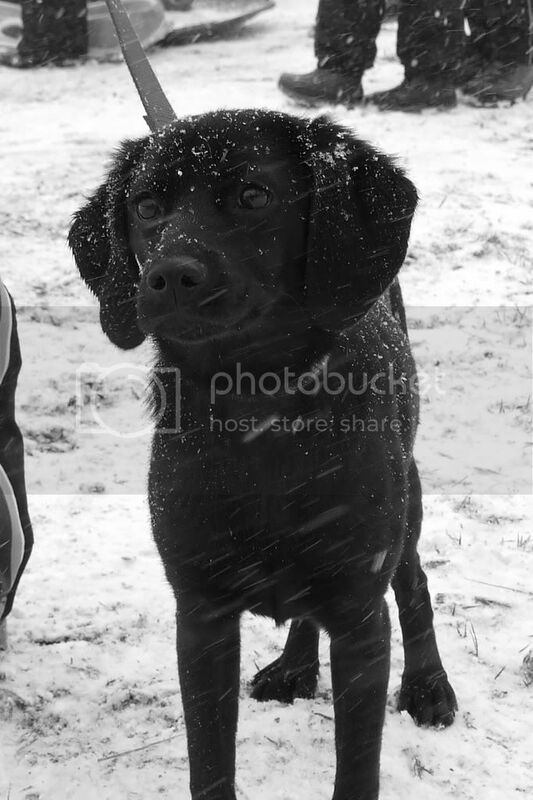 Holly, He is an English Lab, They tend to be shorter and stocker. They are also not as high strung. The puppy phase lasts about 1 year as opposed to 3 or 4 with the American strain. Kaleb get his work out every day. I love the English, they have those big blocky heads and yeah, are calmer for sure. We raely see them around here but I always get excited when I do. They have a very salt of the earth air about them. We rescued Molly about a month ago. She's 8 months old, 20 lbs., a lab and fiest mix. She's a very sweet girl...playful and fun yet calm too, shadows you, good listener, well-behaved, gentle...she's a sweetie. She looks mean....bet shes a good watchdog. Nah, she look ssmart. Like one of those dogs who is watching you intently. Next thing you know they have your car keys and are out the door. You haven't hit the end of the honeymoon period with rescued dogs, she could be part of a dog run auto theft ring. Well, I'm against outside dogs in general, but I'm not sure that's where her standing is,lol. Dogs are pack animals and IMO it's hard for them to be the only member outside, esp. when other dogs are in the home unless they are LGD (Livestock Guardian Dogs) and that's part of their job. 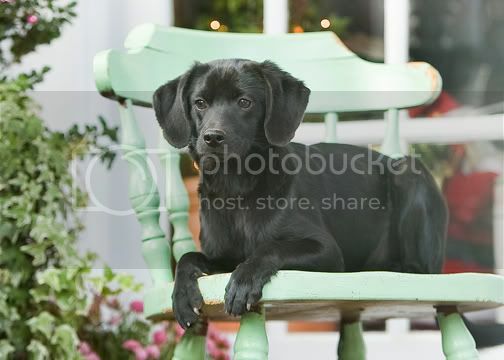 Or some Northern breeds, but I think it would be hard on a Lab. But, again, it's my opinion. I'm a softy. Part of that comes from being active in anti chaining laws, not that you'd chain the dog, I'm just giving a point of context. The other part is studying canine behaviors. People, as a rule don't spend much time outside, so the amount of interaction can be problematic. Hunting dogs are sometimes kenneled outside, but rarely alone. Not only is a dog in a pack happier, they are quieter. Nothing is sadder than a lonely keening hound dog. You just need a bigger house. Well, right there you have your Northern Dog, a working GSD and a working Border Collie. All of whom have personalities that make them more suited. In fact, some, depending on drive lines, make lousy indoor pets and are happier outside. Labs, the 'average' lab has been bred so far out of the working line. They are made to be pets. This happens a lot. Either a breed is shot by careless and overbreeding, Goldens, GDS, Dobies, or the working line is bred out to make them happy homebodies. Even a GSD or BC that has been dumbed down, will be miserable apart from the family. For example, there is a reason the Secret Service almost exclusively uses Malinios now when for years they used GSD's and the Mal people are very guarded of the breed. Hopefull they won't go the way of the GSD. You would have to work very hard to make a Mali like a Golden but if there is a market well, you know. A high drive Mal is a nightmare and miserable in a average pet home and one bred to be happy there would be a really crappy Mal. I don't know if you've ever run across one, but a good working Mal, while smaller then a GSD, has scary intensity. They practically vibrate. So, in short, you'd have to look hard for a Lab from working lines and then you'd have to accommodate the drive. Better to have your goofy, friendly, pet bred guy be just that. I'm sure that's more than you ever wanted to know,lol. Breed dilution is of great interest to me. Some of the dogs I'd like to own someday are Akita's and Orvcharka's. The more primitive Mastiffs, ASD, etc. Dogs that I have no business owning now. There's nothing wrong with having a pet, but it's cruel to make a high drive dog out to be one. Everyone is miserable and the dog gets dumped. Pyrenees suffer a lot, cute white and fluffy puppies that are not pet dogs and need a job. We have rescues full of them. ASD's, Huskies, same thing. Cute puppies, challenging adults. When that day comes, I'd be happy to help however I can. I can also tell you what rescues to stay away from and how to check out a breeder (if you don't know) should you go that route. wow, that was very informative! thanks holly. My wife and I already have enough work to do with our 3 dogs! lol. Akita's aren't mean. They are just a differant type of dog. They can be dangerous when kept by idiots. All dogs can, to a degree, but some dogs have an aspect to their temperament that requires responsible management. I have a GSD/Akita?something mix among the other two. Now that he is three he needs to be managed in certain environments and is no longer a busy dog park dog. But he's only dangerous if you are. The thing is, I learned early on that he looks to me to make that decision. You run into problems when you have the dog deciding who is and isn't a threat. On the other end of the spectrum I have the Leo who is very dog aggressive. Pretty unheard of in the breed and a sign of bad breeding and lack of good care early on (she was 18 months when we got her). Then there is Kinley, who is a year, a GSD/I think hound mix. He is a wonderful, wonderful dog that could have very well not been as he started to get very pushy once settled in (got him at six months), his temperament was why I didn't end up adopting him out and it gave me a valid excuse to keep him,lol. Although i don't recommend three dogs to anyone. He is a very sweet boy who needs consistant boundaries. All that being said, there are certain breeds I think no one has any business owning unless they live on a mountain far away and are really astute dog owners. Some breeds have been kept around for reasons that are really no longer valid. But those are very few and quite rare anyway. There is this idea that if we say a dog is aggressive by nature we are condoning dog fighting. Aggression, prey drive, play drive, ball drive are all parts of what makes a dog suited for what work. An aggresive temperament can be managed and diserable as long as it is a recognised part of the breed, if that makes sense. I would expect a GSD to be an intense animal who trians well in Schutzhund and uses that natural aggression appropriately. An aggresive Golden would be a severe tempermant fault. I prefer a dog with a bit of edge but my Leo is a PIA, it has no place in her breed or job. It's not suited for any other purpose than to act like a rabid Bette Davis. Here's our Toy Maltese, Bitsy. One day when she's gone, she'll be remembered for many things, one in particular being the time she used the top of my Goodall as a launching pad to jump up on the couch. She is very light, but her little nails left a small rut in my top Fortunately it's so light that you have to hold it up to the light to really see it. She look slike she could curl up IN a guitar. What a sweety. That reminds me time to feed mine, thanks.